Pilsen Fencing Rapier Swords for sale are 44 ¾ inches in all and weigh 2 ¼ pounds. 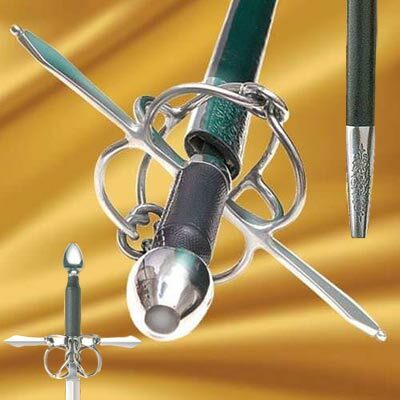 The well balanced Pilsen Swords feature a knot shaped basket hilt and a functional carbon steel rapier blade. These lightweight and quick swords have a 36 inch 1065 high carbon steel blade that is tempered to a good spring. The blade is an inch wide and 3/16th of an inch thick. The wooden handle features a textured real leather wrapped grip. The wooden scabbard is covered in genuine leather and accented by polished steel detailed fittings. Buy the popular Pilsen Fencing Rapier Swords for $279.99.